For provisioning, I recommend you to take advantages of both the commercial supermarket and A-COOP of Nokyo, Agricultural Cooperatives. A-COOP has locally-sourced fishes and agricultural products. 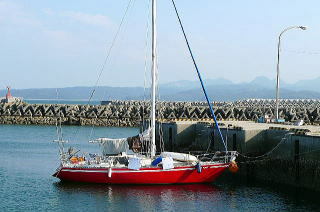 Approaching Himeshima Port, you will see two red lighthouses. The right one is at the west end of one-line breakwater in front. The left one is at the port entrance in the back. Passing by the left red lighthouse to your right, move into the port. Following steps are same with below. A friend of mine says that another place inside windbreak fences located in the west is the calmest berth. When the wind is strong, mooring at the east quay the inside windbreak fences will be good. There is almost no flag which sticks to a foamed-polystyrene buoy, hundreds of which were floating around the port five years ago. The season is same with five years ago. When I approached from the east, there were hundreds of flags which stick to foamed-polystyrene buoys floating from five miles off the port to the entrance of the port. They have hook rigs in the water and stand independently, not connected each other like fishing net. I sailed through between them. Two red lighthouses are seen. The left one is at the left (=west) end of one-line breakwater. The right one is at the right (=east) side of the port entrance. Passing by the red lighthouse at the one-line breakwater to your right, then passing by the next red light house of the port entrance to your right, move into the port. There was an orange ferry boat in the east side within wide port area. After passing by another breakwater running from the west to your left, you will see a pier jutting from the north on your left (= west). 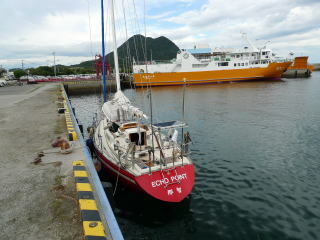 I saw no boat inside the port and decided to moor at the center of the pier, where the quay wall has steps. I let go anchor with a very long rope and moored my boat bow-to. As it is open, you may moor alongside. Stainless rings and bitts can be used for your mooring. 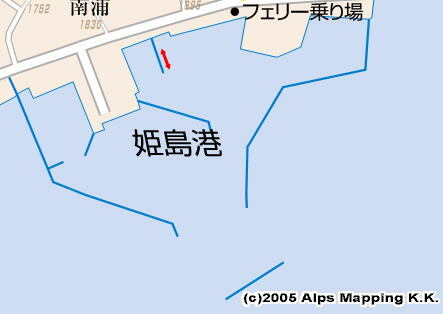 Moor closer to any steps on the quay wall, because the differences in tidal levels are large in Seto Inland Sea. Note: It is shallow with rocks at the north corner of the pier. At the north side, fishing boats are landing fishes. Toilet with a douche-equipped western style is at the ferry station, which opens 5am. Another toilet outside the ferry station opens 24 hours. There are two shops for provisioning. 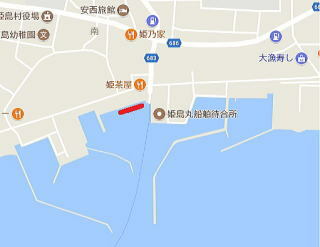 Walking from the ferry station to the north, there is a traffic signal. Turn right, walk 100 meters, then there is a commercial shop. Turn left, there is a shop of Nokyo, Agricultural Cooperatives. The commercial shop had more goods. The Nokyo shop had better fishes. There are some restaurants, because here is a sightseeing spot. Hyoshimizu is a very good Onsen (= spa, hot spring). I strongly recommend your visit on free shuttle bus of the town. Bus time table is tacked up at the ferry station. Bus stop is at Island Center next to Hime-shima Town Hall, 5 minutes walk away. Walter was available at nearby Gyokyo: Fisheries Cooperative Association. They were very kind. Another water tap is at a public water fountain in a park next to the ferry station. Hime-shima Island is in Oita Prefecture, Kyushu, which has English Official Sightseeing Information Site. On the map of the page above, click “Himeshima Village” and click “Search”.